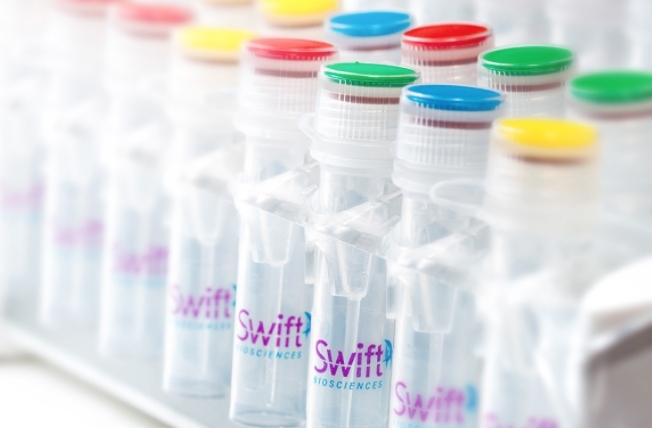 Swift Biosciences, an Ann Arbor-based provider of library prep solutions for next-generation sequencing, today announced early access to its Swift 2S Turbo Library Kit, which offers fast, robust enzymatic fragmentation prep and flexible adapter options to produce high-quality libraries for production-scale genome sequencing. The kits support a wide range of input sample types, including fresh and fresh-frozen tissue, genomic DNA from human or microbial samples, and FFPE and PCR amplicons. The kits also require as low as 1 nanogram input, enable the fastest library prep workflow in two hours, and are supported on two and four channel Illumina sequencing platforms. The kit is a universal library prep kit with an automation-friendly workflow. It is compatible with a variety of applications such as whole genome and exome sequencing for simple and complex genomes. The kit can be paired with indexing solutions such as Swift’s Unique Dual Indexing or Swift’s expanded combinations up to 768-plex. It also enables higher-confidence data and faster turn-around for production-scale labs. Clients can choose from kits with or without Swift adapters in standard 24- or 96-reation size kits or from bulk packaging to have enhanced reagent lot control and flexibility. Swift Biosciences is a biotechnology company that is developing new molecular biology technologies to better characterize and understand the genome. It creates tools designed to advance the DNA sequencing sciences, and its products are designed to help customers analyze biological samples faster, easier, and with greater sensitivity and accuracy, while being compatible with leading instrumentation. The company opened in 2010.